Earlier last year a new family built a house on my MIL’s street. When they moved in she went over to meet them and during the conversation Erin, the wife, asked my MIL if she by any chance knew Fuji Mama. You can imagine my MIL’s surprise! She responded that in fact she did and that I was her DIL and then asked how she had made the connection. Erin explained that she had been looking for recipes online recently and stumbled upon my blog. A picture in one of my posts looked strangely familiar. So she went out and checked and realized that it had to have been taken in their new neighborhood and it looked like it had been taken from my MIL’s house looking up the street. What a small world! When we got back from Japan I knew I wanted to meet Erin. So Mr. Fuji and I went to visit her and her husband’s restaurant/boutique in town. Isn’t this story awesome? FOOD PEOPLE!! The restaurant is called Food For Thought and is in a fabulous old house in Draper, Utah. Mr. Fuji and I ordered some wonderful fresh salads and then finished off our meal with a mini princess cake (just like the ones I was commissioned to make for the bridal shower back in April of last year). After we had paid and were about to leave, I asked the waitress if Erin was at the restaurant, and we got lucky because she had just walked in with her husband and kids. Mr. Fuji and I got to meet them all and were delighted that they were as wonderful as we had hoped they would be. Last month my MIL and I went over to Erin’s house to deliver some holiday treats that we had made them (I contributed toffee, of course!). Erin sent us home with a box of what she called Crispix Arare, which disappeared so quickly that when I went to snap a picture of it the next morning, there was hardly any left! Erin also invited us to come over on New Year’s Day because she and her family were going to be cooking a traditional Japanese New Year’s feast. Oh, did I forget to mention that Erin and her family are Japanese? I told you this story was awesome! So New Year’s Day Mr. Fuji and I stopped by their house and ended up staying for the meal and coming home with bento boxes filled with treats to share. We were SPOILED. While we were there, I also made sure to ask Erin if she would be willing to share her recipe for Crispix Arare with all of you, because it was so addictively good. The day before we left to drive home, she dropped off a recipe card with the recipe. So here we are! Arare means “hailstones” in Japanese and refers to little rice crackers that come in a variety of flavors, both savory and sweet. This recipe takes the oh-so-popular American snack of Chex Mix and combines it with the flavors of Japanese arare to make a very successful and addicting snack. The mix is both sweet and salty, which I’m always a sucker for. I loved Erin’s combination of rice chex (to keep it authentic! 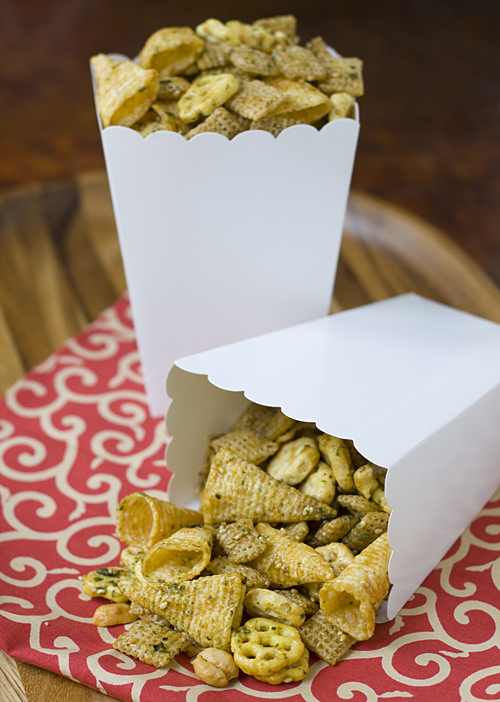 ), Honeycomb cereal, and Bugles, but you can use whatever combination you love (just make sure you use the same total number of cups)! The variety of shapes, textures, and flavors made the mix that much more exciting. The final touch in the mix is the use of Nori Komi Furikake , a Japanese seasoning made of seaweed, sesame seeds, salt and sugar. I know it might sound weird, but I’m going to go out on a limb here and say that you are going to be pleasantly surprised if you give it a try! And as you reach the bottom of the bowl way too quickly, don’t blame me, blame Erin!! 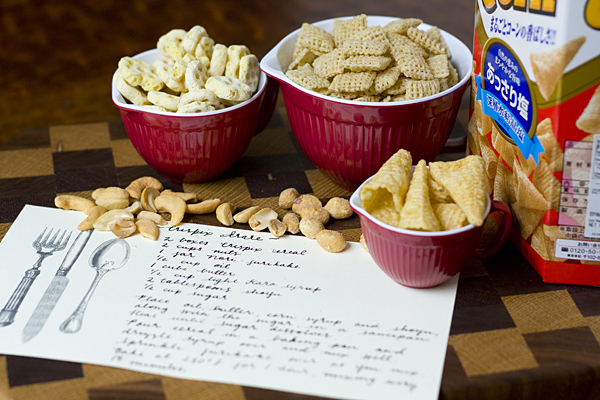 Recipe Notes: You can use whatever cereals or snacks that you love in your Chex Mix. Just make sure you use a total of 13 cups! I used a combination of cashews and peanuts, but again, use a total of 1 cup of whatever nuts you love. 1. Preheat the oven to 250 degrees Fahrenheit. 2. Place the oil, butter, corn syrup, soy sauce, and sugar in a medium saucepan. Heat over medium-low heat until the butter melts and sugar dissolves. 3. 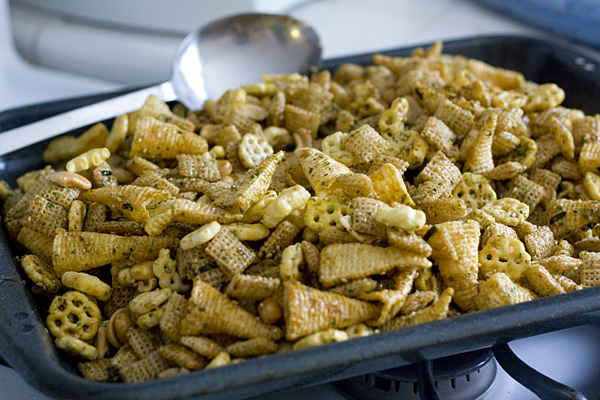 Pour the Crispix, Honeycomb, Bugles, and nuts into a large baking pan. Drizzle ¼ of the syrup over the cereal mix and mix well. Sprinkle ¼ of the furikake over the mix. Continue adding syrup and furikake and mixing until all ingredients have been added and the cereal mix is evenly coated. 4. Bake for 1 hour, stirring the chex mix every 15 minutes. Spread on paper towels to cool, about 15 minutes. Store in an airtight container. 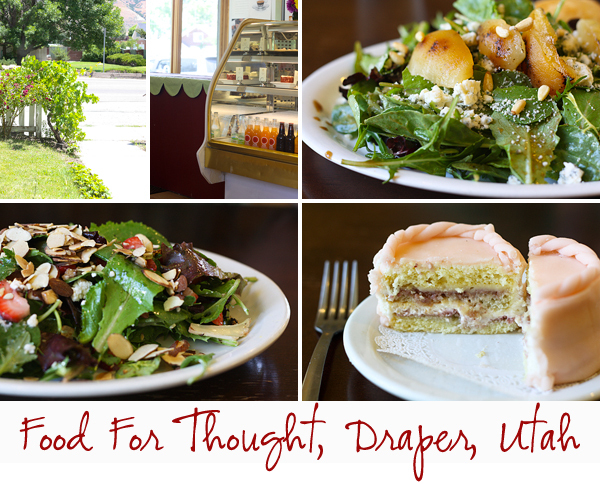 * If you are ever in the area, you shouldn’t miss a stop at Food For Thought, even if it’s just to pick up a couple of treats to take home! 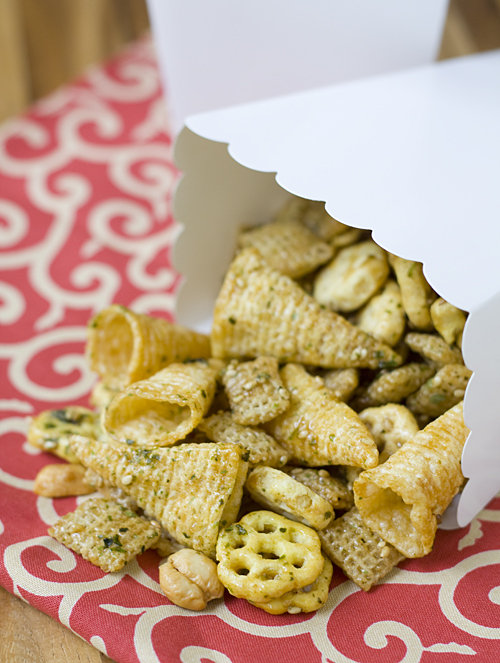 That looks delicious, what a great idea to add Japanese flavors to Chex Mix. This is a fun recipe. I love eating at Food for Thought. It is a little taste of heaven in life. What a fantastic story! 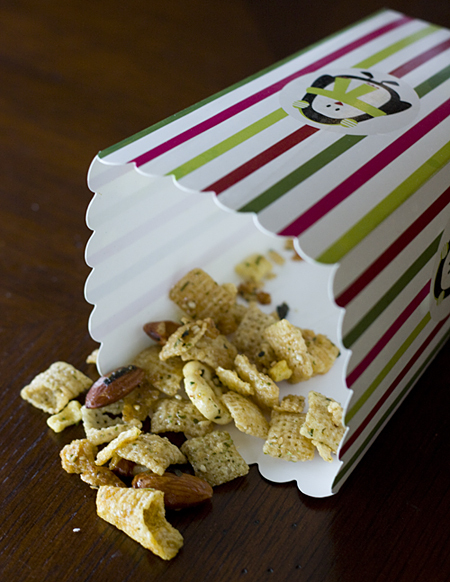 I love furikake on everything…and love this chex mex blend. How yummy! our family has had chex mix this way for many many years! there is also a peanut butter version (without furikake) which is also very addicting! 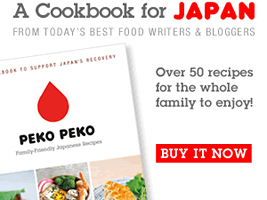 I absolutely LOVE furikake so I’m going to have to make this. Sweet and salty is always a winner in my book. Actually, I might make this as one of the things to trade at my food swap group… hmm! 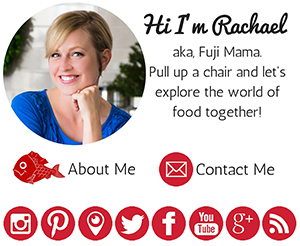 Thanks for the recipe Rachael! Wow– this looks delicious! Definitely going to make this soon! I love stories like this. Such serendipity! And then to get such an tasty treat out of it (I know because I had some) . . . Awesome! As you know you originally had me at Arare, but now there are Bugles, too?! I haven’t had those in years! What a great excuse to have to get some. Well, I’ll be making this at some point. Probably Super Bowl Sunday. Can’t wait! Also try throwing salted popcorn in! People in Hawaii mix popcorn and sakura arare with furikake sprinkled on them — staple food at the movie theaters. 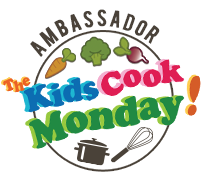 What a fantastic story…..and you got a great recipe out of it too! We have to compare toffee recipes! Hope you and your family are fully recovered from holiday “bugs” – lovely post! Love your story! Thanks for sharing! I love new ways to change up Chex Mix, and I can never resist the sweet and salty combo! Can’t wait to try it! Thank you…and thanks Erin! What a small world! I’ll have to check that place out next time I drive through Utah! I LOVE this story! We will have to check out that cute little restaurant soon! Hope you are all feeling better! Miss you! I spy bugles… my downfall. This looks awesome! That’s so funny – small world! This snack looks fantastic! What a bunch of WILD coincidences!! That, and this looks fantastic. Can’t wait to try it! 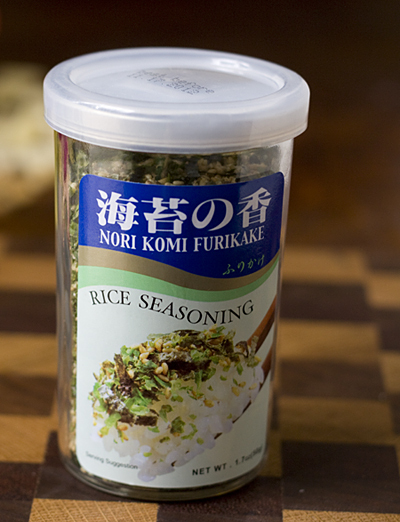 What do you think about using different kinds of furikake? I use the yasai one all the time for rice but I’m not sure about how it would work with this dish.. but I’m curious! What a fun story! I absolutely adore Food for Thought. Not only is the atmosphere cozy, but the soups and salads always hit the spot. I will have to try this recipe! We have a friend in Hawaii that sent us a huge container of this and got addicted to it. My sons first birthday is around the corner so we wanted to make some favors with it, but of course it would be cheaper for us to make it ourselves. I just found your recipe on Pinterest and tried it today and we were pleasantly surprised that it tasted exactly the same. We added a cup of gold fish pretzels as we have the Octonauts theme going. It tastes so good. We are so happy we found this recipe. Thank you so much for posting it. I am all over your Chex Mix Arare! I love Asian flavors! When I read the recipe I see 1/4 cup light corn syrup and 1/4 cup granulated sugar, off set by 1 tablespoon soy sauce and 1/4 cup nori komi furikake. Of course, you developed the recipe and you know what you are doing, but tell me, does that amount of soy sauce and nori hold up to all that sugar?? Is this Chex Mix more sweet and just a little Asian flavors? I know the ingredients can be adjusted. I was just hoping to hit it a little harder on the side of Asian flavors. What do you suggest? Thanking you in advance for your time! Wat a wonderful story and cheerfully written. Reading it makes me so happy! I’m researching for rice crackers and stumble upon your blog. Happy I did, following your blog now!